Meaning: It was commissioned to gift out to all the great WallaFriends I made in the many years of playing this game. Which number Unique is this for you? It was my 2nd Unique. When I commissioned my first one, I had no plans to do another, but Andy really gets you hooked. Closing Thoughts: I am not as active as I once was. By placing it into the store, I am able to put my Unique out there so all players can add it to their collections. 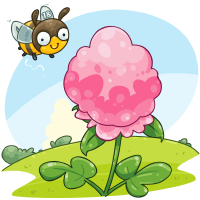 I especially hope that the clover finds all the new players that I haven’t had the chance to interact with yet. This entry was posted in Unique Spotlight on November 14, 2018 by WallaBee.